Great news for fans of AJ Styles! AJ Styles was one of WWE's biggest contractual concerns this year with the former WWE Champion's deal allegedly running out in 2019, meaning there was the possibility that the 'Phenomenal One' could leave WWE and go elsewhere, perhaps to AEW or NJPW. WWE has been beset with rumors of Superstars being unhappy and different wrestlers handing in release requests. Dolph Ziggler, Mike and Maria Kanellis, The Revival, Hideo Itami, Dean Ambrose and more have been linked with leaving the company or wanting to leave the company. In Dean Ambrose's case it appears that, for now, he's chosen not to renew his contract which expires in April this year. Other Superstars whose contracts expire this year are allegedly Paige, Shinsuke Nakamura, The Good Brothers and, as mentioned, AJ Styles in April 2019. Wrestlingnewsworld.com first broke the news that AJ Styles re-signing with WWE was as good as done on their Raw Views Podcast, but have since released an article confirming that the popular star has indeed signed a new deal keeping him at the WWE for years to come. I can now confirm that the former WWE Champion and WWE have come to terms and agreement for a new contract. At this time, the details of the contract are unknown, however, we can report this contract will keep Styles with the company for the foreseeable future. I am also being told that Styles has set himself and his family up financially for the rest of his life with options outside of the ring. WWE wanted this deal done and looks like they got it. You might be tempted to write off Wrestlingnewsworld.com because they're not one if the bigger wrestling news sites, but I know one of the guys there quite well and they've been correct about similar things in the past so I'm willing to vouch for them here! 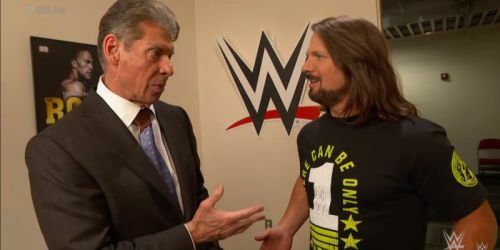 If AJ Styles has indeed re-signed with the WWE then it truly is great news for Vince McMahon and company! Do you think AJ Styles should've left WWE? Leave your thoughts in the comments section below! WWE/AEW Rumors: List of WWE Superstars whose contracts expire this year; Will they go to AEW? WWE Rumors: Kenny Omega to have meeting with Vince McMahon and Triple H; Signing with WWE? WWE Rumors: Many WWE Superstars signing with AEW?